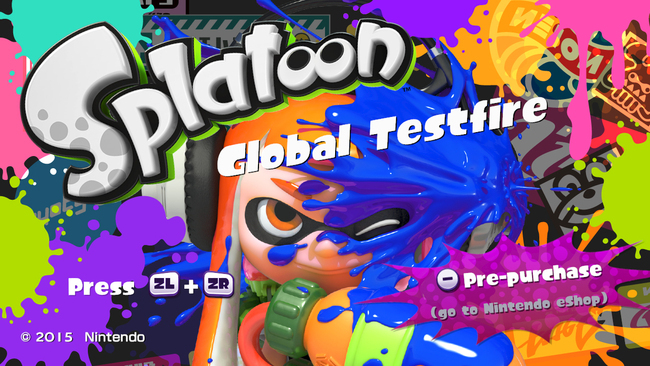 Round one of the "Splatoon Global Test Fire" has finished, let the discussion begin, the anticipation build, and the pre-downloads grow! So, what are initial reactions to the game, the control, and the overall feel? The controls are solid, but take a little getting used to. You use the WiiU pad to look aim and the right analog stick to move the camera. The left analog stick controls movement, and the gun (at least the basic splatter jr. gun I used) fired with zr. Eventually the control felt smooth, but I admit the first few rounds I got the camera and aiming functions mixed up. Such an incredible amount of fun, I hardly know where to begin. Yes it lives up to the hype, at least from my experience. Not only does the competition feel friendly and fun between the different teams, but there is a nice element of competition to it from teammate to teammate. Can I score the highest on the team? Can I get more "kills" (or whatever they are calling it) than other players? I never once felt mad when another team won, and I like that. I like when if I lose I don't feel robbed or that the other team cheated or that the game control caused me to lose. Even waiting has advantages as there's a jumping squid mini-game on the pad that you can play while waiting for other players to join. I can't wait to use Amiibos on this new franchise, because the potential added gameplay on what already seems like a great upcoming game has me pumped. I know people were annoyed that Nintendo chose not to have in game chatter in the game, and I now having actually experienced the game, I'm 50/50 on the decision. On the one hand, if there was a function to talk, I'm not sure how hard it would be to implement. Even if you only had each team able to communicate with their teammates using the mic function, it might get too chaotic. Not to mention the programming might have been too hard to do. I'm not sure. One Major drawback, and no, it isn't the over-powered paint roller: If your team loses someone due to lag or drop, you are basically hosed unless you manage to play so aggressively that you continually knock out you opponents players before they can gain much ground. Yes, the paint roller is overpowered, but not so much that it can't be overcome through clever playing and coordination from your teammates. However, you can't make up 300-500 points that a dropped player would have brought. Keeping in mind that this is essentially a demo, improvements and tweaks may or may not be forthcoming. It wouldn't surprise me if somewhere along the way they tweak the paint roller, just as I'm sure they'll add in cool new weapons and custom characters as DLC. I look forward to doing a more thorough review when the game get is officially released because so far--Nintendo has more than delivered the goods. But that's just this Jester's opinion.